Mulberry trees are either male or female. Only the female trees will produce fruit. Mulberry trees are cold-hardy and well-suited to grow in New England. The red mulberry is native to the area, and other varieties either grow in similar environments or have been cultivated to grow in the New England region. Common mulberry (Morus alba) is also known as white mulberry and is native to China. The tree grows from 30 to 50 feet tall and is about the same in width, with a dense, round crown. Chaparral white mulberry (Morus alba "Chaparral") is a dwarf male cultivar of the common mulberry and produces no fruit. The tree grows from 6 to 8 feet tall and 8 to 12 feet wide. Morus alba "Pendula" is the female version of the "Chaparral." Red mulberry (Morus rubra) grows up to 35 feet tall with a short trunk and a round crown. The dark-green leaves of the common mulberry come in different shapes and both lobed and non-lobed. The leaves turn a dull yellow late in the fall. Green-white flowers bloom from March through June. 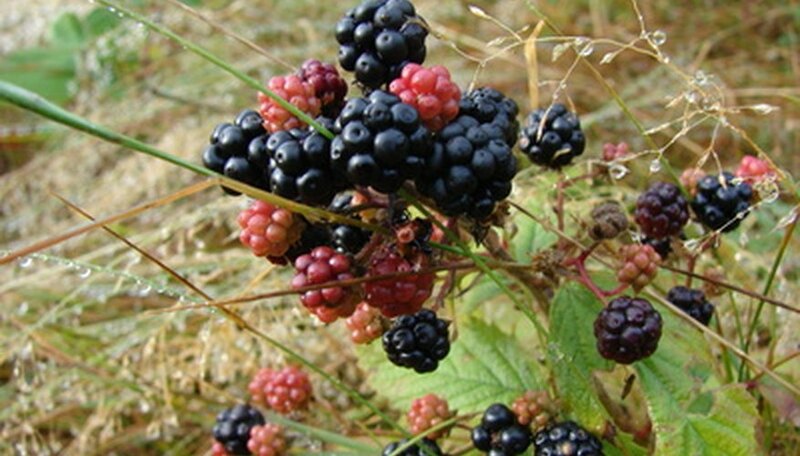 The edible fruit ripens in June and July, measures up to 1 inch long and is a mix of white, pink, red and purple. The bark is a light tan and the stems a yellow-brown in color. "Chaparral" white mulberry features whitish-green flowers that bloom in March and April. The branches weep and display dark-green, lobed leaves up to 8 inches long that turn yellow in the fall. Red mulberry grows egg-shaped leaves up to 8 inches long with or without lobes that turn a bright yellow in the fall. The flowers and fruits are the same as the common mulberry. Common mulberry is drought- and salt-resistant and likes full sun and a moist, fertile, well-drained soil. "Chaparral" white mulberry grows in full sun or partial shade and a soil that is moist and well-drained. The plant is heat- and drought-tolerant. Plant red mulberry in full sun, partial shade or full shade and a soil that is moist to dry. The mulberries are a treat for the local bird and small animal population. Use common mulberry and red mulberry as a specimen tree in an area where the falling fruit will not cause a problem. "Chaparral" white mulberry is planted close together in groupings and is used as a container plant. The fruits are used to make pies, jams, juices and wines. The fruit is soft and stains concrete and patio tiles. Mulberries are susceptible to leaf spots, bacterial blight, powdery mildew, canker, mites and scale. The unripened fruit and the sap are toxic and can cause upset stomach and hallucinations. Missouri Botanical Garden: Morus Alba "Chaparral"